This defeat of the native Welsh forces led by Llywelyn ap Gruffydd and then briefly after Llywelyn’s death by his brother, Dafydd, resulted in a much divided Wales. On the top of the hierarchy, instead of native rulers, were English (mostly) absentee landowners. Within the Marche and portions of southern Wales, the native rulers had sided with the English anyway, and thus retained their land. Among the peasants, their lot in life didn’t change much. In Gwynedd, however, which had been the seat of Welsh resistance for centuries, the English overlords directly intervened in the life of the local populace and attempted to root out and confiscate the lands of those who’d rebelled. For example, of the 104 shares of land in the Denbigh area formerly under Welsh control, the English confiscated, through a variety of means, 96 of them, or 92.3% of the total (Given, James. 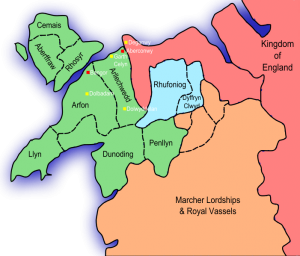 The Economic Consequences of the English Conquest of Gwynedd. Speculum. Vol. 64. No. 1 1989). Given goes on to say: “The acquisition of sizable tracts of land allowed the English to work some changes in Denbigh’s ethnic and social composition. The new rulers made a determined effort to establish an English colony . . . all the original inhabitants of the vill adjoining the head of the honor at Denbigh were removed, and a borough was created in the castle’s shadow. Other Englishmen were settled nearby. In the town of Lleweni, for example, only one Welshman, Iorwerth ap Llywarch, was allowed to retain land. The rest of the village was divided among about 120 English colonists” (p. 18). Interestingly, except for confiscating Llywelyn’s own lands, and Edward’s extensive castle building program, Edward’s treatment of western Gwynedd appeared at first to be more lenient in that he deliberately kept the native system of land ownership intact. Instead, he extracted money from those who owned land in a complete overhaul of the rent and taxation system. In the past, rent consisted of a combination of food renders, labor services, and compulsory hospitality. Under the new regime, it was all cash payment and the increases ranged from 78.5% for cash rent from free tenants to a 7-fold increase for bondmen (p. 25). In order to establish his authority in the region, he built a series of castles across Gwynedd, among them Caernarfon, Beaumaris, Conwy, and Harlech. The English also: required individuals to “grind their grain at the lord’s mill, press their grapes at his wine press, bake their bread in his oven, etc.” and pay for the privilege. They also were compelled (according to a 1305 record) to attend the local market and to trade only within the (English) borough town walls, resulting in more taxes. “In a period of twenty years, thanks to steady and determined application, the English administration had managed to increase its take from its Welsh territories almost three fold” (Given p. 25-31). Other impacts included an overhaul (and rejection) of the long-standing Welsh system of laws set down by Hywel Dda and the impressment of Welshmen into the English miltary. “Just as the Welsh may have had to bear a disproportionately heavier share of taxation than the English, so it appears that they made a relatively large contribution to royal armies . . . For example, of the 12,500 infantry raised for the 1298 Falkirk campaign, 10,500 (84%) were Welsh” (Given p. 35). Given concludes that the result of the English occupation forced the Welsh to sell themselves, their property, and their possessions to placate an ever more avaricious English government. “Sometime early in the fourteenth century, in a petition delivered to Edward II, [petitioners] informed the king that because of their poverty and impotence they had left their lands, unable to pay their rents reliefs, and other dues. In 1324, the villeins of the commote of Eifionydd . . . were so vexed and impoverished by the demands of the men who were farming the king’s mill and fish weirs that they experienced great difficulty in holding their land . . . [others claimed] that the royal purveyors had so impoverished them that they could barely live” (p. 43). Given concludes that, contrary to previous scholarship and received wisdom, “the growth of political authority, generally saluted as one of the positive features of late-medieval society, may in reality have been one of the primary causes of the crises that afflicted Europe in the late Middle Ages” (p. 44). That’s possible, but given Edward’s intent to wipe out all memory of Llywelyn, his seat and family, along with Welsh nationalism, this attempt to conquer the Welsh financially makes perfect sense. Coupled with his castle building program, it shows how successful Edward was not only at defeating the Welsh militarily, but ensuring their material defeat and continued (and continual) subjugation. I happened to read that Given article just last week and, if I understood (and now remember) correctly, events in and around Denbigh weren’t typical. While many Welsh landholders were removed within the new English lordships, it was especially so in the Denbigh area as only there did the population become largely English. I’ll take this opportunity to add that I’ve learned a lot from your posts, too. 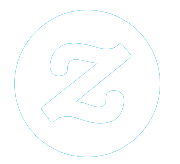 This is definitely a blog to bookmark. Thanks for commenting. I’m glad it’s been helpful. Very nice overview Sarah! Not much different than today I think, maybe less forceful but you can see the roots of modern governmental control in these events, which is fascinating.